We are at the end of Financial year and all life insurance companies have launched some new plans to cash in the last minute “tax saving” frenzy. But do you know that some of life insurance policies might not give you the desired tax benefit both at the time of investment and also at the time of maturity. Eligibility for Life Insurance policy to get Tax Benefit? Only insurance policies which have sum assured of more than 10 times the annual premium paid would be eligible for Tax Benefit u/s 10(10D) at the time of maturity payment. At the time of investment the tax benefit would be limited to minimum of (annual premium paid, 10% of Sum Assured, Rs 1,50,000) u/s 80C. This change is for all Life Insurance Policies bought after March 31, 2012. As a special case for life insurance of the disabled and those suffering from ailments, the annual premium can be less than 15% of the sum assured – i.e. – Sum assured should be greater than 6.67 times the annual premium. This change was made in Budget 2013. Also Budget 2014 has mandated 2% 1% (effective June 1, 2016) TDS on the amount payable at maturity under Section 194DA for all payments greater than Rs 1 lakh. So this taxation is getting stricter and trackable. Budget 2015 has introduced the facility to fill Form 15G/15H in case your annual income is less than the minimum taxable limit and you don’t want TDS deducted on Life Insurance maturity payment. This would be effective from June 1, 2015. The above changes in tax laws applies to all kind of Life Insurance Policies, be it ULIP, Endowment Plan or Return of Premium Plans. In case the Life Insurance does not qualify for tax benefit as above u/s 10(10D), the income received at the time of maturity on survival would be added to your income and taxed to your marginal tax rate. You need not worry about the Term Insurance as the Sum Assured is always more than 10 times the annual premium paid. But if you are investing in ULIPs, Endowment Plan or Return of Premium Plans you need to do a thorough check. There might also be cases where a Life Insurance policy can be Tax Free for only a selected group of investors. Take example of HDFC Standard Life Insurance online ULIP – HDFC Click2Invest. In this case the investors opting for Single Premium would not get tax benefit u/s 10(10D) as the sum assured is only 1.25X of annual premium paid. Also investors with age more than 55 years would not get any tax benefit at the time of maturity as the sum assured is only 7X of annual premium paid. Only investors opting for regular premium payment and aged less than 55 years would get full tax benefit both at the time of investment and at the time of maturity. Do check and recheck before investing in these plans! Remember Life Insurance should be an “expense” to cover the risk of your life and never an “Investment”. I opened a Canara HSBC OBC Life Insurance policy on 28-Oct-2009 and paid five installments of Rs 1.0 lakh in the next five years. I surrendered it on 14-Feb-2017 and got Rs 7,03,866.27. Kindly advise what should my reply to IT dept be? Lic premium paid by un married son is permit to deduct under 80cc for father income tax filling? Whether TDS should be deducted in cases of pension plan, where there is NO sum assured and on death only fund value will be payable. So in case of Partial withdrawal from such pension policy whether TDS will be deductible ? Yes TDS would be deducted! BUT LIC SAYS WE GIVE 125% DEATH SUM ASSURED SO PARTY WILL BE ELIGIBLE TO GET MATURITY UNDER SECTION 10 10 D OF INCOME TAX ACT. The sum assured should be 10 times the annual premium paid to get tax benefit. As per LIC Shiromani if the sum assured is 1.25 times of 1 year premium it would be eligible for sec 10(10D) tax exemption. But why do you want to invest in LIC policy which gives so poor returns? My HDFC Single PREMIUM PENSION PLAN matured and I am paid full amount under pretext of making one other HDFC Policy. I on receiving payment confirmation found that communication refers to payment … on account of Surrender has been credited to your bank account as per the NEFT facility chosen by you. NO TDS was made. Is there my any tax liability? If yes, My Question is whether I am to pay Tax on full maturity proceeds or can I deduct my premium amount. If it was surrender of Pension plan, TDS should have been deducted @ 1%. Also the entire surrender value (without deduction of premium) is taxable as “Income from other sources”. It is for sure that no TDS was deducted as it does not show in my form 26AS. It was a pension plan and the full amount paid to me. Shall I seek clarification from my Insurer, is there any possibility the amount paid to me can qualify for tax exemption as there was no TDS. Reconfirming from insurance company would be helpful. As per me the maturity amount should be tax free. They should not have deducted TDS in this case. You should show it exempted income in ITR. If answer to both question is YES then the amount received is tax free else its fully taxable. 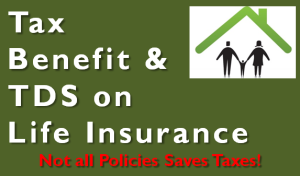 Check more details @ How are ULIP & Life Insurance Policies Taxed on Surrender & Maturity? I am paying Rs 50000 annual premium in HDFC SL money back policy issued on Feb’13. Recd Rs 1.22 lakhs (25% of sum assured amount Rs 4.86 lakhs (excldg rev.bonus and terminal bonus). HDFC deducted TDS @1% u/s 194DA. Kindly clarify whether I need to include Rs 1.22 lakhs as “Income from Other sources” and pay tax as per my tax slab or whether it will qualify for 10(10)(d) exemption. I’m 29yrs and availed LIC endowment plan-14 on 13 June 2011. Sum Assured = 3,00,000, Policy term = 5yrs, Premium payment term = 5yrs & Premium mode = Quarterly(Rs.16,211). On maturity I received sum = 3,47,490 (which is after TDS from 3,51,000 – 3,510). Now, Is maturity amount 3,51,000 is taxable under other income. If not, how to get exempted during tax filling. If your maturity or surrender amount is taxable you will have to show it as “income from other sources” and pay full tax accordingly. In case the maturity value was tax free, just include the same in tax exempted income and show the TDS in tax paid. If extra TDS has been deducted, you’ll get the refund.